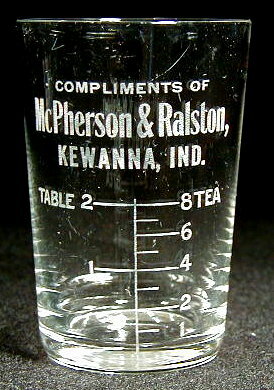 Inscription: COMPLIMENTS OF / McPherson & Ralston, / KEWANNA, IND. Below is a measure: TABLE 1-2 TEA 1-8. Dimensions: 2-11/16" x 1-13/16" x 1-7/16"
Condition: Aside from the usual light handling marks, the glass is mint!